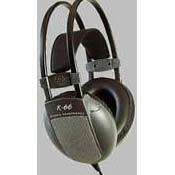 I have quite a few pairs of AKGs, including my benchmark Austrian K240s from years ago. Impedance is everything when comparing headphones. After much comparison listening from many sources including several mp3 players to my best stereo and pro music equipment and in many styles, I am not overly impressed with my old set of K66's. These are more suited to high impedance, low power music devices than to pro mixing and recording equipment. On my pro stuff, these seem to have a better overall response than on my lower quality players but are very bass-heavy with higher impedance equipment to the point of deadening the soundfield and high frequency response. Tend to sound more like some of my cheaper headsets. With better equipment (lower impedance) have a more balanced response, not as boomy but not as transparent as my better K240s and K301s. Build quality is very good, have taken alot of abuse and have held up well for years, except for the headphone plug which I had to replace after much use. Pads and headset are typical lightweight comfortable and sturdy AKG quality. So a kind of puzzle overall, as these are overly bassy IMO with boomboxes, mp3 players etc. and yet despite a better less boomy response with better equipment, still not one of my favorites for real audiophile quality. The transparency and definition is nowhere near as good as my AK240s, but then for the money I guess these are OK in a pinch. Have better response with percussion and drum sounds than with anything else, so I am guessing these have been tuned more for better mid-range response than extreme low or high frequency material-more suitable for vocals for example. Value. Quality for that value. Comfort. Not overly emplasised on bass, but you can auctually feel it if you try hard enough. Great. If you want a cheap pair of quality cans, go try these out. Many people say they have poor bass, but i assure you not. Its only that it filters out the side of them because they are semi open. A little bit of eq'ing can, and does do wonders. They do go really, terribly loud, without any noticable quality loss. I mean those vocals still peirce my brain and turn it to mush. I dont really have anything to reference them against, but i would say the audio reproduction is near perfect. I dont listen to many studio cds these days, but those losslessly compressed concerts have never felt the same. I have a memory of hearing a drummers leather seat make a noise in a silent bit of a song. Ohh so quiet, but still there. The value of these is off the wall. Considering you can pay au$50 for some cans at an electronics store, the extra $30 that the increce to these has been is worth 10 fold. - Bloody great sound - A design that folds around the human head perfectly - Try before you buy them, to make sure they are for you. I havent found any downfalls of them. At first, i went to the store with nothing in mind except a $120 limit. They has 3 pairs of cans. One cheap 'ol set, $340 studio pair, and then the 66's. First i listened to some jazz on the $340 pair, although they were open, they sounded really really nice. But i quickly discarded those for the price. I tryed out the 66's, and i was expecting the price for them to be well over what i could spend. I was so happy when i found out how much they were. The sound is blissfull, period. After 72 hours of very ancious burning in i put them on and was further blown away. They might look flimsy and breakable, but they use this to their advantage, being stiff enough to sit atop your head firmly, but flexable to the extent of absorbing most drops (which i have wittnessed firsthand :[ very nervous moment). To this day i would never swap trade them for anything short of astounding. Call me stubboun, but i love em. Hook them up with a good sound source and you have a good listening experience. The semi-open design helps produce a natural sound arena around your head, and i havent had any problems with outside sound getting in, but mabey thats because of the music i listen to, and how i listen to it =] There is not a huge overpowering bass impact with these cans, so if thats what your looking for, look elsewhere. If your into pure, precise soundwaves, you have my advice to buy these. Best Buy. One of the best on the market at this price. Aside from the quality of the sound reproduction, these are the best value for headphones I could find. For instance, my roommate paid more for his Sony MDR-V300s, and they don't sound quite as good, and are quite fragile (He's getting that split that all MDR-V300 users have) in comparison. They're also quite comfy. These are HUGE! I wouldn't reccomend wearing them outside. Except in the winter. They make GREAT earmuffs. Don't plan on gelling your hair. The headband is self adjusting, and you can't wear them in any other position. For the money, I haven't seen a better pair of headphones. Other products I've tried in this price range pale in comparison. After trying them out in the store with various equipment (CD players, synthesizers, etc), I felt they were fairly decent. One thing I noticed was that they didn't have that great performance at lower frequencies (about 20-30hz). But that was fixed with a slight bit of EQ fiddling. Everything else was pretty good though. I'd definitely reccomend them to anyone who was in the market. Sony MDR-V300 Sony MDR-V150 Sony MDR-CD280 Other random headphones. In my opinion the best value priced headphone on the market.AKG makes quality headphones,from their least expensive models to the most expensive.The build quality and durability of the K66 is not seen or "Heard" in this price range from other headphone manufacturers.I've had a few of the so-called "AudioPhile" brands of headphones and I'm not saying those headphones are not good,but they are extremely overpriced.I also recommend the AKG K401's which I also have and go for about $120,and the K401's sound far superior to headphones that I have heard that cost more than twice that price!! Good headphones for hook-up to a PC or portable CD player. Bass can be a little mushy and the treble is certainly not the last word in transparency. forgiving of poor sources. Sennheiser is too revealing and poor bass. I did'nt like the Sony's because of the hinged design for dj monitoring. I like the Denons and Beyerdynamic's. Senheiser HD600, Denon AHD950, Sony MDR V700, MDR V600, Beyerdynamic DT 990. After a good run-in, These headphones go LOUD, Very fast and imaging is breathtaking at the price. After I'd connected them up to a pink-noise generator for about 50 hours, I was itching to try them... So I plugged 'em in with the supplied adapter and put on my favourite CD... Oh My GOD!!! The joys of the CD came rushing back to me... TINGLES DOWN MY SPINE!!! Imaging was spot on. All the drums on Terry Bozzios' Drum were immaculately placed before me... The Bass guitar of Anthony Levins was rumbly and had a real kick. And as for Steve Stevens Guitar... I was left breathless. For the price, these headphones have overall good sound quality and are exceptionally comfortable. The lower bass, however, is lacking. used it to hear all kinds of music from vivaldi to black sabbath..Found the treble okay ...bass was not that impressive, midranges are quite good. But the music flows in this head phones...Build quality is okay .. more of plastic ..what do expect for this price??? what you should keep in mind is the price and the comfort you can get from this entry level model.